What parent hasn't thought her child was a brat at one point or another? Whether your child really is a brat, is at risk of becoming one, or is simply trying to grow up in a world filled with temptations and distractions, you'll love this book! It's the ultimate hands-on guide to cultivating character traits that are tried-and-true 'bratbusters.' Full of no-nonsense, practical 'Tips and Scripts,' You're Not the Boss of Me offers just the help you need to deal with many of the more challenging behaviors typical of four- to twelve-year-olds. 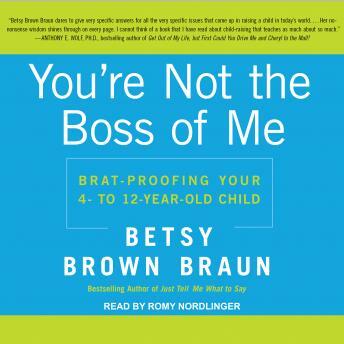 With Betsy Brown Braun's humorous, supportive, and authoritative voice as a guide, navigating some of the most exasperating aspects of these formative years with confidence and laying the groundwork for your child's future just got a whole lot easier.